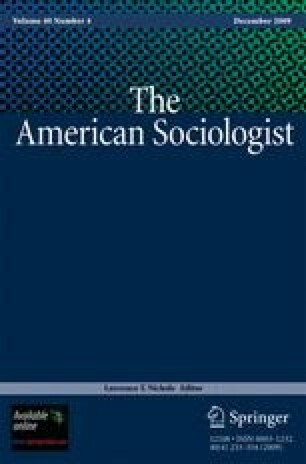 In recent years, the discipline of sociology has seen an increased discussion of public sociology, but the discussion has focused on whether or not it is a good idea for sociologists to become more engaged with their various publics. A different question motivates this research: What are the institutional arrangements that make doing public sociology difficult, and thus less likely? Following Dorothy Smith, we start from the perspective of frontline actors and ask them about their experiences. We combine data from two sources: individual interviews with a sample of 50 academic feminists, a group that has theoretical motivation to be interested in public sociology and group interviews with 15 feminists engaged in some form of public sociology. These informants tell us about two related institutional barriers to doing public sociology: the culture of professional sociology and the standards we use for evaluating scholarship. The impact of these disciplinary barriers probably varies by institution type and career stage but there is reason to suspect they generate costs not just for individuals but for the discipline. Taking steps to break down these barriers would ameliorate concerns some have raised about public sociology. American Sociological Association. (2003). How does your department compare? A peer analysis from the AY 2000–2001 survey of baccalaureate and graduate programs in sociology. Washington, DC: American Sociological Association. Retrieved July 29, 2009 (http://www.asanet.org/galleries/Research/DeptRpt2001_Sect3.pdf). American Sociological Association. (2008). Community Action Research Initiative (CARI Grants): The Sydney S. Spivack Program in applied social research and social policy. Washington, DC: American Sociological Association. Retrieved July 25, 2009 (http://www.asanet.org/cs/root/leftnav/funding/funding_overview). Cornell University. (2006). Department of development sociology. Retrieved on July 25, 2009 (http://devsoc.cals.cornell.edu/). North Carolina State University. (2009). Department of Sociology. Retrieved on July 25, 2009 (http://sociology.chass.ncsu.edu/). University of California-Berkeley. (2009). Department of Sociology. Retrieved on July 25, 2009 (http://sociology.berkeley.edu/). University of Illinois-Chicago. (2009). Department of Sociology. Retrieved on July 25, 2009 http://www2.las.uic.edu/depts/soc/. University of Massachusetts-Amherst. (2008). Department of Sociology. Retrieved on July 25, 2009 (http://www.umass.edu/sociol/). University of Minnesota. (2009). Department of sociology. Retrieved on July 25, 2009 (http://www.soc.umn.edu/). U.S. News and World Report. (2009). Rankings: Sociology. Retrieved July 25, 2009 (http://grad-schools.usnews.rankingsandreviews.com/best-graduate-schools/top-sociology-schools/rankings).